The LZR laser welding systems provide a powerful machine with all the technological and engineering benefits of other larger models. This compact machine delivers a higher-duty cycle that meets demanding work needs, with professional results, and for far lower cost than larger machines – a truly significant benefit for any budget. The LZR models are easy to move and set up, easy to use and easy to maintain. Larger opening in the weld chamber provides access for larger pieces and allows you to work more freely inside. Memory cells allow you to save up to 32 individual, specific configurations for your most-used applications. Small footprint fits easily into any shop. Affordable – take advantage of laser welding at a cost that is truly budget friendly. Up to 60/100 joules of output energy is more than enough for nearly every laser-welding application – particularly on silver. Output pulse energy: 0.25–60 joules. Output pulse energy: 0.25–100 joules. Output pulse energy: 0.1–125 joules. The open laser was developed primarily for precise laser welding work on large pieces. The mold & die and plastic injection industries can save thousands of dollars by repairing their pieces instead of replacing them. 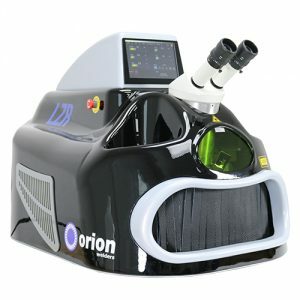 The Orion open laser allows for those laser welding repairs. From it’s generator to the fiber optic output, the Orion open makes fast work of shaping and adding metal to worn or damaged areas on pieces as large as 1000x1000mm. 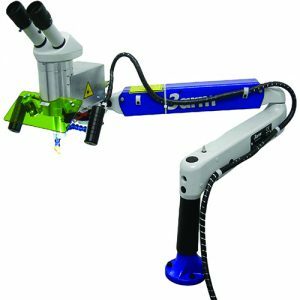 Mounted on an articulating arm, the Orion open laser can easily move to a position needed to make the repairs. The power range is impressive as it is adjustable from 0.1 to 200 joules.